The tropical storm FALCON was estimated based on satellite (at 4AM today) and surface data at 370 km East Northeast of Tuguegarao City (18.8Â°N, 125.3Â°E) with maximum sustained winds of 85 kph near the center and gustiness of up to 100 kph. 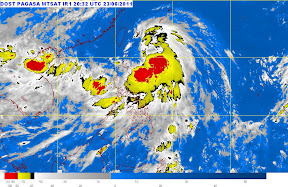 According to PAG-ASA forecast, it will move North Northwest at 19 kph. Here in Caloocan, I woke up early in the morning today at around 4AM because of the strong wind blowing and loud sound of the rain showers. Although our place was not affected by floods, I am praying that the rain will diminish or eventually stop. The islands of Calayan, Babuyan and Batanes will have rains with gusty winds while the rest of Luzon and Western Visayas will experience monsoon rains which may trigger flashfloods and landslides. Mindanao and the rest of Visayas will have mostly cloudy skies with scattered rainshowers and thunderstorms. Moderate to strong winds blowing from Northwest to Southwest will prevail over the rest of Northern Luzon and coming from the Southwest to South over the rest of the country. The coastal waters throughout the archipelago will be moderate to rough. We should always be ready in times like this. Some of the things that we should be prepare of are food (biscuits, can goods), water, flashlights and clothing. This entry was posted in News and Entertainment and tagged storm falcon, tropical storm, weather forecast falcon. Bookmark the permalink.